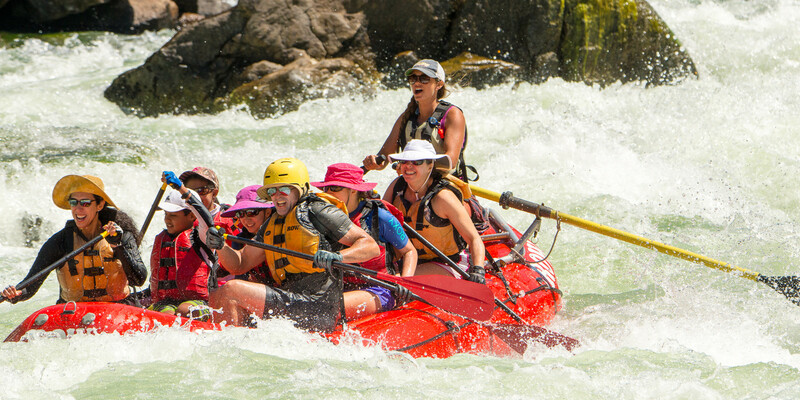 Rogue River rafting is unlike any other white water raft trip in the United States. Where else can you raft a wilderness river and stay in a comfortable lodge each evening? Middle Fork Salmon RaftingAmong whitewater rafting rivers, the Middle Fork of the Salmon in Idaho is a legend. Lower Salmon River RaftingWelcome to the Lower Salmon River...and a rafting trip only dreams are made of! ROW provides adventures in some of the most beautiful places on the planet. You can visit all of our offerings in more than 20 countries around the world, including our most popular spots by going to our new website, Unbound.Travel. Explore the rich and diverse cultures of Europe. Find your perfect adventure from all the destinations we serve. Same incredible adventures, just a new name. ROW runs it's first trip on the lower Owyhee. Launches on the Owyhee River are strictly controlled and more than half of the river is designated Wild & Scenic by Congress for its incredible diversity of scenery, wildlife, and plants. ROW also offers trip on Oregon's Grande Ronde river this year. Betsy joins the team! Working side by side, she and Peter guide trips and build the company into what it is today. Her joy for life and passion for sharing nature with others is woven into ROW's tapestry and she continues to play a pivotal role in operations today while managing to still get behind the oars as often as possible. ROW pioneers whitewater rafting on North Idaho's Moyie River and also starts trips on the lower Salmon River Canyons. Betsy and Peter spend their honeymoon leading ROW's first yachting adventure to Turkey. Here they are pictured on a sarcophagus at the ancient Lycian city of Xanthos. ROW is selected by the US Forest Service to outfit trips on the thunderous Lochsa River and starts operating there with one to three-day trips. 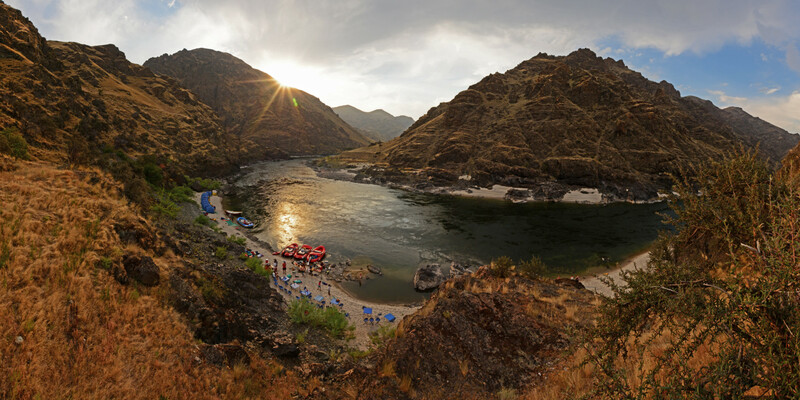 ROW acquires the Snake River business of Salmon River Challenge and starts trips on the deepest canyon in North America! ROW pioneers trips on Idaho's St. Joe River one of North Idaho's most beautiful river canyons. Today we are the only outfitter on the St. Joe offering rafting and fishing trips. ROW becomes the first US adventure company to run tours in Croatia, part of what was then Yugoslavia. To this day ROW works with the same yacht and family on our Taste of Croatia tour. ROW offers the Middle Fork for the first time. It quickly becomes a beloved option for it's natural and untamed beauty, prolific rapids and fascinating history. The Middle Fork remains our most popular rafting adventure today! ROW starts one-day rafting trips on Montana's Clark Fork River. A team of seven ROW guides make the first descent of Ecuador's Rio Upano, one of the headwater rivers of the Amazon. The six-day journey was epic and was eventually nicknamed "The River of the Sacred Waterfalls." From left: Tim Kaufman; Mike Arndt; Peter Grubb; Juan Rodriguez; Lonnie Lane; Nancy Mertz; Jay Beal. ROW expands operations on the Snake and Middle Fork to include raft supported hiking tours, offering another way to see the stunning river canyons and scenery. This same year, Betsy and Peter take on a daunting new endeavor - parenthood. Inspired by their adventurous children, who fearlessly accompanied Peter and Betsy from the river banks to the seashore and beyond, our Family Magic trips were born - providing a unique space for families to unplug, connect and explore together along the banks of the Salmon River. ROW, as Remote Odysseys Worldwide, returns to Croatia, now a new country, as peace has finally settled in after the Berlin Wall falls in 1989. ROW scouts the Upper Missouri River in central Montana along the historic Lewis and Clark Trail. In 2000 we launch the first-ever voyageur canoe adventures accompanied by specialist historians. ROW acquires Sevy Guide Service's business on Idaho's Bruneau River. This is Idaho's most remote wilderness river trip, bar none. Betsy and Peter buy the old Syringa Cafe on Highway 12 on the Clearwater River as the future base for Lochsa River operations. Lochsa River trips start meeting at the newly-opened River Dance Lodge Syringa Cafe. River Dance Lodge - Idaho's Outdoor Adventure Resort, opens with 8 log cabins, each with private hot tubs! Betsy and Peter traveled together with New York Times writer Tim Neville and photographer Chad Case for the final shake down of our trail-blazing Galapagos Unbound tour. ROW starts tours in Peru, often in conjunction with our Galapagos trips. A new itinerary is developed to including kayaking on Lake Titicaca. ROW Fishing Adventures begins with trips on the St. Joe, Coeur d'Alene and more! Mariah and Peter Grubb travel to Washington, D.C. to lobby for the Owyhee Initiative which was signed into law in 2009 by President Obama. We launch the ROW Adventure Center with half-day trips on the Spokane River, kayaking on local lakes and cycling tours. The Bowen-Grubb Family spend 16 days in Jordan, camel riding in Wadi Rum and scouting out a new ROW trip. Weeks later was the start of the Arab Spring. Jordan remains one of the only countries to remain stable throughout the past decade. ROW's new trip Superlative Idaho wins National Geographic's Tours of a Lifetime Award. We run our first trip on this itinerary! ROW acquires the Rogue River business of Whitewater Warehouse thus offering lodge-to-lodge rafting for the first time to ROW guests. ROW Adventures acquires Sea Kayak Adventures from founders Terry Prichard and Nancy Mertz (old ROW guides) adding a new line of sea kayaking and whale watching adventures in Baja and British Columbia. Betsy and Peter lead ROW's first trip to Antarctica laying the foundation for an entire line of Polar Travel. Peter and Betsy scout a new trip in Namibia. They also explore Botswana, Zambia and South Africa. A year later they launched journeys to Africa in our portfolio of adventures. Sea Kayak Adventures expands to La Paz, Baja to offer trips on Isla Espiritu Santos. ROW Adventures is chosen by the readers of Travel + Leisure as the World's #1 Tour Operator. Betsy and Peter travel to New York City to receive the award. Peter leads a group of adventurous Texans along with Tim Neville, from the New York Times, on an uncharted adventure through Albania and Montenegro on the Peaks of the Balkans Trail. Sea Kayak Adventures runs first trips along Italy's Amalfi Coast. Candy Benning celebrates her 20th Anniversary with ROW! Our longest tenured employee, Candy still works for ROW as our USA and Rivers Sales Manager. Father and daughter, Peter and Mariah Grubb on ROW's first sea kayaking adventure in Cuba. in 2015 ROW becomes the first US based tour operator to offer sea kayaking and active travel options in Cuba. Peter leads our first sea kayaking and hiking trip to Corsica, France. The trip earns the distinct honor of being selected as a National Geographic Tour of a Lifetime! ROW brand Cuba Unbound expands to offer biking tours, hiking and a new kayak itinerary in the east of Cuba. ROW Adventures launches it's new brand Adventure Unbound, creating a home for it's international line of "Unbound" adventures. Adventure Unbound is voted in the top 5 of the world's best tour operators by Travel + Leisure Magazine readers. 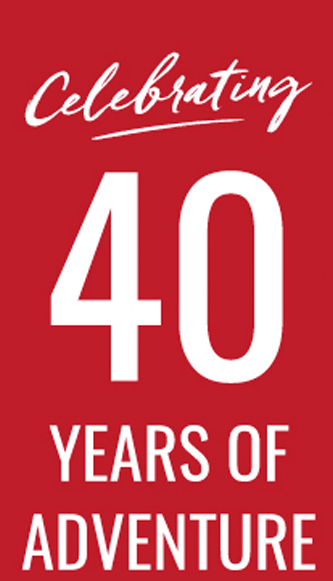 ROW Adventures celebrates 40 years of Sharing Nature and Enriching Lives. Being an alumni has never felt so good. Take one trip with ROW Adventures and let the benefits begin.